UX research is an important part of your Project Design and Development strategy because it protects you from designing the wrong product. Imagine creating something that nobody wants to use because you didn't do your research.You are wasting your hard work, time, and money..
UX research, you’re discovering the right requirements for the right people at the right time. This is the reasons that UX research is a bigger part of any process and in any field. Usability testing refers to evaluating a product or service by testing it with representative users. Usability testing lets the design and development teams identify problems before they are coded. The earlier issues are identified and fixed, the less expensive the fixes will be in terms of both staff time and possible impact to the schedule. See what are component or workflow. How are others doing it? Identify what works, what doesn't’t, and what might be missing. and opportunity for improvement? Understand what’s considered “best practice” and why. accessibility means that websites, tools, and technologies are designed and developed so that people with disabilities can use them. More specifically, people can:perceive, understand, navigate, and interact with the Web,contribute to the Web . Web accessibility encompasses all disabilities that affect access to the Web, including: auditory, cognitive, neurological, physical, speech, visual. User Experience design is concerned with every part of how a user interacts with a product. That involves things like understanding interaction design, information architecture, and usability. Qualitative research ensures Customer Validation, Clarity and a Thought Process. UX without User Research and without studying Human Abilities in NOT UX. UXExpert, 5 Year Old India's TOP 10 Best UX/UI Solution Provider Startup from Pune, India Founded by Mr.Tushar A Deshmukh, having over 18+ years of Industry Experience. 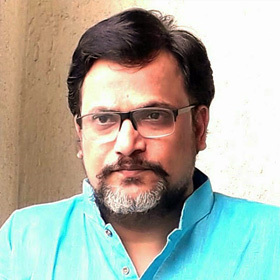 To know more about Mr.Tushar Deshmukh click here For Last 5 Years UXExpert, giving its UX services for Web and Mobile Technologies and has client base across globe. We are UX Specialist and offering our UX services to various domains like Health Sector, Logistics, Hospitality, Food and Restaurants, Finance, Bio- Science, eLearning, Agriculture and so on. Our holistic approach on UX has helped our customers to establish their products and services with greater ROI. 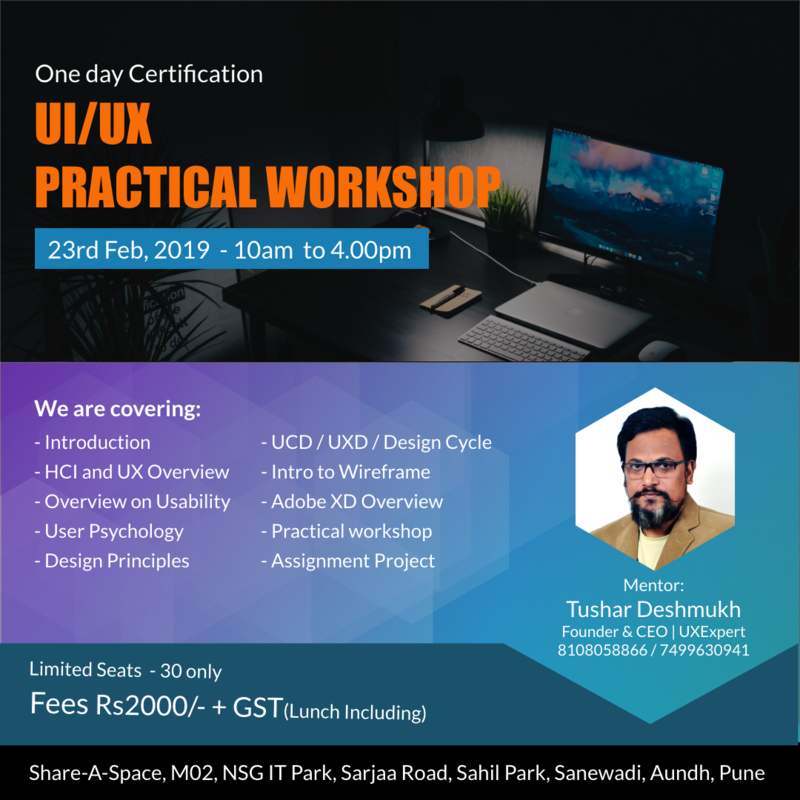 Recently we entered in a new venture of Training - UXUITraining, Pune here we try to give correct industry focused training in UX and UI. Professionals and Fresher's are taking advantage of this and under Mentorship of Mr.Tushar they are building new career opportunities. With this quality UX Experience now we are entering in a more deep field of UX, we are now starting this UX Research as a Service. Take advantage of our experience and let's build some thing more user friendly. Every Product, Service, Industry required User Research. We have developed dynamic methods for UX Research. Semantic and 3600 approach on every domain help us to understand users. Choosing the Right UX Research Method encompasses a variety of investigative methods used to add context and insight to the design process. Observations - first step in UX Research. Design researchers must train themselves to observe. Naturalistic Observations or with Participation in User Tasks. Understanding in UX Research is more to do with mental models. Mental model is the image that someone has in their mind when they think of a particular interfaces. Analysis is the process by which the UX researcher identifies patterns in the research, proposes possible rationale or solutions, and makes recommendations. Interviews - user interviews to understand their tasks and goals One-on-one interviews are a method of communication between a researcher and a user,stakeholders. UX Research some times required quick and need to test many users in less time this time these methods are useful. The goal of a card sort is to explore relationships between content, and better understand the hierarchies that a user perceives. Usability testing involves all type users and personas of a product to complete a set of tasks, and Goals and test determine the usability of the product or service. App or Website’s architecture needs to be evaluate and test, tree tests are helpful in validating that architecture. An A/B test is typically chosen as the appropriate UX research are struggling to choose between two competing elements or interfaces. We are active Socially, Keep in Touch.